A: We’d like to welcome back to VOV Ms. Johnelle Roseanna Lakeland of the UK. It has been more than two years since we last heard from her. A: Thank you for coming back, Ms Lakeland and thank you for your feedback on both the technical quality of the program and its content. It’s disappointing to hear that our signal on 7280 khz is unstable in the UK. Last month many UK listeners reported very good reception on this frequency. You can listen to our show again on the internet at vovworld.vn or on our mobile app called “VOV Media”. We hope to receive regular feedback from you. B: We’d also like to welcome back Miss Muskan Gupta of India. Her last feedback on our program was in December 2017, almost two years ago. We hope you have been listening to us since then and hope to receive more frequent feedback from you. A: This week many listeners, particularly in India and Bangladesh, expressed their interest in Vietnam’s observance of Vesak Day next month at Tam Chuc pagoda, Ha Nam province in the north of Vietnam. B: Tam Chuc pagoda is in the Tam Chuc Tourist Complex which covers an area of 5,000 ha, 60 km from Hanoi. The complex is built on the foundation of the original Tam Chuc pagoda and encompasses new structures, a parking lot, a large lake and a lush forest. Tam Chuc Pagoda enchants visitors with its impressive architecture and spectacular setting. A: The original pagoda built in the Dinh dynasty 1,000 years ago, has been ravaged by time. People began restoring it a few years ago and the first phase of the project will be completed by May 2019, when the pagoda will host the UN Day of Vesak 2019. B: The Tam Chuc Pagoda Complex includes a three-arch gate, several temples and a Jade Pagoda. Inside these places are gigantic, beautifully carved Buddha statues. 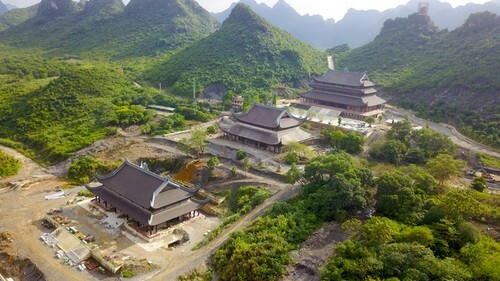 The 3-storey Jade Pagoda provides an impressive view of the entire complex. A: In addition to giant blocks at Kim Lan ceramic village in Hanoi, there are 12,000 murals depicting legends of Buddha carved in volcanic rock by Indonesian artisans. There are plans to install a garden of 99 stone pillars, each 13.5m high, carved with Buddhist teachings. 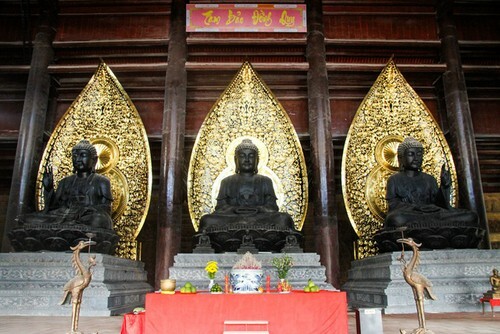 B: Three colossal Buddha statues in black bronze representing the past, present, and future sit at the very heart of the main worshipping temple. These statues weigh over 100 tons each and are the biggest statues in Vietnam, surpassing those in Bai Dinh pagoda. A: UN Vesak Day will be celebrated at Tam Chuc pagoda from May 12th to 14th. 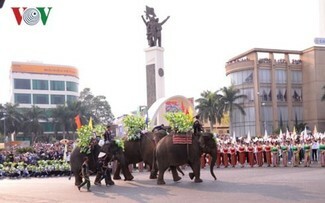 This is the third time the UN’s commemoration of Vesak has been held in Vietnam. 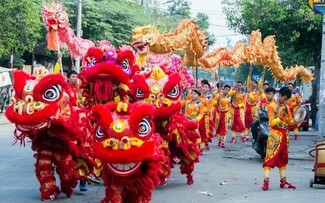 It previously took place in Hanoi and Ninh Binh. The event is expected to draw 1,500 spiritual dignitaries, researchers from other countries and thousands of Buddhist followers. 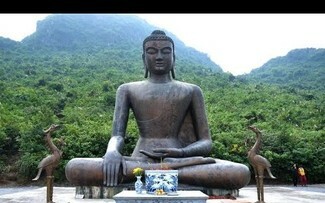 Visitors can contact the Vietnam Buddhist Sangha to register for the celebration. B: This week Shyamal Kumar Banerjee of India listened to our program on April 9 at 16:00 UTC on the frequency of 7220 khz and gave reception a SINPO rating of all 4s. Mr. Banerjee and several other listeners said they wanted to know more about the development of solar energy in Vietnam. B: Aware of the potential of renewable energy, the Vietnamese government has adopted a strategy for renewable energy development in Vietnam by 2030 with a vision to 2050. A: More and more companies are getting involved in wind and power generation and the manufacturing of batteries and solar equipment. According to the strategy for renewable energy development, Vietnam can generate more than 10 billion kWh of renewable energy by 2025. 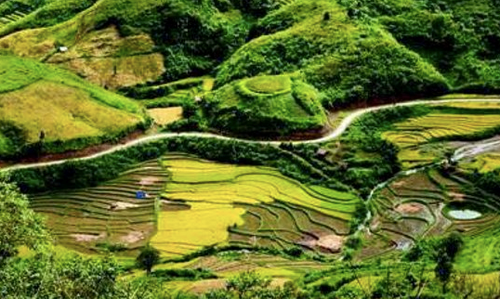 B: Vietnam’s Central Highlands region, which has 2,600 hours of sunlight per year, is gearing up solar energy projects. In Gia Lai province 23 investors have registered 33 solar power projects with a total capacity of 4,000MW. A: Vietnam’s biggest solar power plant, with a rated capacity of 168 MW and a total investment of 194 million USD is under construction in Ninh Thuan province. The plant is being built by Sunseap Group, the largest clean energy solutions provider in Singapore. 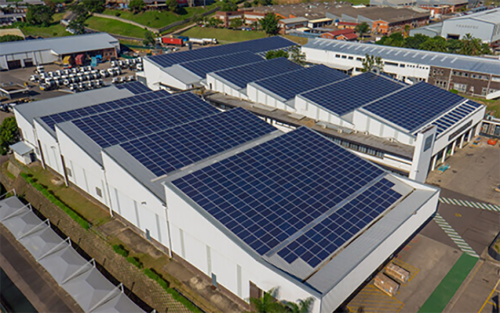 Once operational in June 2019, the plant will supply over 200 million kWh of electricity annually to the national power grid. B: It is expected to provide electricity for 200,000 households and generate jobs for 200 local workers. Ninh Thuan receives special attention from investors as it has big advantages for renewable energy development with an average wind speed of 7-8m/s and 2,800 hours of sunshine every year. A: The province aims to become a renewable energy hub generating 2,000 MW of solar power by 2020. 30 Vietnamese and foreign investors have been approved to build solar power plants in Ninh Thuan which has the potential of tapping some 9,000 MW of solar energy. B: We’d like welcome Rafael Arnay of Spain to VOV. In his first letter to VOV this week, Mr. Arnay expressed his interest in shortwave broadcasts saying he listens to both English and Spanish programs on VOV. A: Mr. Arnay, we’ll send you our program schedule and frequency list. Our programs are also available on the internet at vovworld.vn and on a mobile app called “VOV media”. We look forward to receiving your feedback on our programs and will send you a verification card for each of your report. B: We’d like to acknowledge letters and emails from Siddhartha Bhattacharjee, Muhammad Shamim, and Debakamal Hazariak of India, Richard Lemke of Canada, Mizanur Rahman, Dilwar Hussain Dilu, and Abdul Mannan of Bangladesh, M Saleem Akhtar Chadhar of Pakistan, Muneer K P of the UAE, Dmitriy Kutuzov of Russia and Gerry Neumann of the UK. A: We’ll send you all QSL cards to confirm your reports. We welcome your feedback at English Service, VOVWorld, Voice of Vietnam, 45 Ba Trieu Street, Hanoi, Vietnam. Our email address is englishsection@vov.org.vn. Thank you for listening to VOV on shortwave and following us online. Goodbye until next time. We are celebrating the greatest festival Bengali language new year. Our all radio club members celebrate this program.So we are happy. All childrens & percent road rely. "VOV NATUN RADIO LISTENERS CLUB"
President, Kanchan Kr Chatterjee. Murshidabad.